I have been experimenting with faux druzy. The colors and combinations are limitless! I have been having so much fun making these. I had the opportunity to take a course called "Flying Lessons" given by a very talented artist - Kelly Rae Roberts. It was an excellent course that covered such topics as letting go of yours fears, going after your true passion, and many other things. One of the best things about the course was, I got meet and learn about a lot of talented artists, all in on different paths, but all working towards making their dreams come true and learning to take flight. Flygirl Fridays is all about these wonderfully talented people and a little bit about them, so you can get to know them as well! Hi Violet! Thank you for this exciting opportunity to share a bit of my journey with your readers! I’m Rhonda Franks, sole owner and Jewelry Artist for my company, MoonSeazenDesignz. I specialize in OOAK Art-to-Wear pieces made primarily from gemstones and sterling silver. But I also use pearls, crystals, found or vintage objects, and sometimes work in copper and brass. I design my work for the woman who knows herself, has many “facets” to her personality, and likes to show the world who she is with confidence by wearing statement jewelry. My pieces speak to collectors desiring a timeless design that will provide them with a lifetime of enjoyment. I have a distinctive style, but I don’t confine my designs to any one theme – I don’t like constraints! So, I do fine jewelry as well as arty pieces, Boho, ethnic, and sea-themed pieces as well. Sometimes I do things that are just plain fun, cuz this is jewelry, after all, and “Girls just wanna have fun”, too! After decades working in health care as a “healer”, I have transferred my energies into being a “healing artist”. I truly believe that the world needs to have beautiful things to focus upon, and wearing something that makes you feel beautiful is invaluable to one’s health and state of mind. It’s a fun job, and somebody needs to do it, so here I am! What is something that you really love, and why? I love so many things, but I would have to say that the Ocean is my greatest love (aside from my family, of course). I’m a Pisces and naturally gravitate towards the water. I lived on a tiny island for over 16 years where I marked my time by the moons and the tides. That was where MoonSeazenDesignz was born. To me, “MoonSeazen” is a state of mind. A quiet time surrounded by nature, contemplating the stars, hearing my own inner voice and feeling peaceful contentment with who I really am. I found that there on the island. I also love the way the ions in the salt air transport my mind to a more peaceful space, and bring clarity to my thoughts. And collecting what washes up on shore has been a lifelong pleasure. I also love tropical gardening. Being dirty and sweaty and getting exercise the good old fashioned way, all the while solving my life’s problems while my hands are doing other things is one of my great pleasures in life. Music has always been a love of mine. I am a classical pianist, and I love just about every genre of music there is. It is my companion during long hours in my studio, and I have favorites that zoom me right into “the zone” when I need to get down to business. My most recent love has become collecting old Paint By Number paintings. I fondly remember doing some as a child. What I like most about them is how the character of each painting is dictated by the hands that painted it. No matter that the design was dictated, each person’s style, whether a shaky hand, or a crisp touch, makes each one unique. My favorites are the old Cockatoo’s and Flamingoes – love the colors! They also remind me of the process I went through as a surface pattern designer in the “old” days when it was done by hand and not on computer. Honestly, I’m living in my dream project right now! I enjoy being completely immersed in Gemstone World! I love the way they feel, the healing energies they radiate, and how beautifully unique they are. I love the freedom I feel to let my imagination take me where the stones want to go. I truly “Dream of Beading”, solving design problems and coming up with great inspiration in my sleep! A perfect day is waking up full of ideas, having a “free schedule”, getting some music playing, and starting my day at my jewelry bench. My mind is always brimming with way more projects than my hands can possibly finish! It gives me reason to be excited about waking up each day and creating something new. My bigger dream is that I find an agent to successfully market my originals so I can devote my time to creating. I would love to have more sales, not only does that help validate my work but it would ensure a steady flow of new stones needed to fuel my “need to bead”! I love to “Bead by the Sea”…and someday hope that I can make that a daily reality. Other than that, I would like to get published in some of my favorite jewelry publications, and be accepted into a prestigious gallery. In retrospect, I realize that admiring all the beautiful flower, shell, feather, fiber and seed leis and jewelry created by the various island cultures where I lived and travelled had a huge impact on me. I love seeing nature displayed in all its glory, that’s a gift we have been given. I always visit museums wherever I go, even the tiny little ones in remote outposts. I keep a sketchpad with me and make drawings to inspire my work. But I had no idea at the time that I would ever be designing jewelry full time. It was something that chose me! When the lightbulb went off in my head, I thought it was crazy, never having made jewelry before, it was an entirely foreign medium to me. I share the following because there are so many women I have known that find themselves at a loss in mid-or-later life as to “what is my thing?” I heard that over and over from so many talented women who were truly saddened that there was no “Ah Ha!” moment, directing them as to what path to pursue. It’s a natural need for us humans, artists especially, to find something that truly gives meaning to our existence through something we do or create. So it can be very frustrating when you feel lost and without direction. I lived in that world for about 5 years, during a time when my previous career ended itself, I had relocated thousands of miles away, and it was time for me to re-invent myself, again! I felt like a Tapestry, a “Coat of Many Colors”, as an artist. There were many things that technically I “could” do, but they just weren’t resonating inside me….For example, I started my college studies in the field of Fashion and Interior Design, taking retailing, advertising, marketing classes as well as fashion history courses focusing on the Art of Adornment over the years. I bailed out of fear of starvation, changed to a healthcare field, but even though that was my bread and butter income for many decades, I never let go of my study of art. Aside from taking every craft class known to man, LOL!, I became a Fine Arts Major at a wonderful University where I was able to study the principles of design and color, sketching, painting, art history courses, and sculpting. And who knew that sculpting was my favorite thing of all??? I never would have known that had I not had to do it! After moving to CA, I had the opportunity to enroll in Zeida Rothman’s Studio of Fabric Design in Berkeley, and completed my portfolio under her tutelage. (She has since morphed her school into the American College of Fabric Design). I formed my own business as a freelance Surface Pattern Designer, flew to NYC by myself to check out the Surtex exhibition, carted my big Pratt Europa portfolio all over LA to various design agencies, and ended up moving to the islands and hiring an agent instead to sell my work on commission. Art being an expensive mistress, especially when painting on consignment, I found myself working 2 jobs to live and not enough time to paint on speculation. I became a basketmaker instead! I went into the rainforests and foraged for invasive vines whose woody stems made great basket bones, and learned to dye hemp fibers using native plants. I loved the sculptural aspects, the physical exercise of tracking down my vines and reeds, and created some stunning things, that didn’t last because the wood beetles ate them for breakfast, lunch, and dinner! Eventually, I ended up operating our healthcare business full time for over a decade. Fast forward to FL, 2004 where hubbie and I landed. I didn’t want to work for someone else. I could have formed a consulting firm, but my heart wasn’t in it. I immersed myself in Construction Project Management for our old 1940’s home, and interior design. It was very exciting because after the deprivation of living on tiny islands for decades, everything was at my fingertips a short drive away! And, I had done landscape design for many properties I’ve owned in the past, so I started landscaping, had many offers for jobs, I loved it but not the snakes here, so I decided not to go that route! I began doing floral designs with silk flowers and things, and many people, my husband included, encouraged me to become a FT Floral Design artist….I enjoyed it, it felt easy and natural to me, but I still didn’t get the feeling that “this is my thing”. I continued taking art classes of all types, acrylics, watercolors, and I quilt and weave and knit and do all sorts of needlearts…. One of my favorite things to do is go to Antique and flea markets, and I found myself in a mecca of that here…I felt pulled to do mixed media, using odd old bits of things I would find on my “junk hunts”, and suddenly I found myself staring at old brooches and jewelry, and there happened to be a Lapidary Arts shop 5 minutes from my house….That did it! Once I went in, met the artist/owner and she introduced me to the world of gemstones, I was hooked! So, one never knows where their path will lead. My advice to burgeoning artists who are searching for “their thing” is to keep moving, keep trying new things, learn all you can wherever you can about different techniques, and one day your thing will find you! And when it does, all the things you have done and learned, all of your experiences will create an indelible mark on your work, making it personal, and will help you create a unique niche for yourself. Actually, there are 2 that had a profound effect on my work. The first comes from a quote by Ira Glass that I keep posted over my workbench which says in part, “Do a lot of work…It’s only by going through a volume of work…that your work will be as good as your ambitions…You just gotta fight your way through.” So true! I virtually took apart and remade everything I created for the first 2 years. Then I took apart about 75% of my sork the 3rd year. Last year, I was down to about 20%. I also have a motto, “Never crimp at night” because I’ve learned that just trying to feel “finished” with something, does not a great piece make! I sleep on it, and I’ve learned to hear that little voice that says “This is not working” on some level or another. If I’m no 100% satisfied, no one will ever see it. Period. When I started out, I was under the mistaken impression that something had to be “hard” to be of any value (too many Russian novels under my belt, I guess! LOL!). So I would create these intricate and complex patterns that didn’t give the eye any place to rest. They were way too complicated! Wendy gently redirected me, and suddenly my pieces were flowing from my fingers like water…I remember telling her that I feared if it looked too easy, no one would want to buy it because they’d be like “That looks so easy I could do it myself!” I say this with humility, because sometimes as an artist, when something comes so naturally for you, you discount the value of your skills. Not everyone CAN do what you do. And if you make something that seems to sing with simplicity, it’s not an easy task!When your work flows with ease, that is a beautiful gift, and if we have that, we need to respect and honor that. What is the biggest thing holding you back? What change do you think would most help your business grow? My hubbie and I agree that the time has come for me to stop trying to learn and do everything I need to do tech-wise, social media and all, by myself. Trying to do it all has really delayed the full launch of my business. I need to contract with some service professionals. I want to get my blog rolling, have big plans for that, and for my online website. I bought my domain name long ago, and it’s calling to me! What’s the biggest thing that you took with you from Flying Lessons? The group! I love my Tribe! It’s a community that walks the talk when saying “We all deserve to be successful. We all as artists have a place under the sun.” And we can all genuinely and wholeheartedly support each other on our journeys, share without fear (emotional or financially based). We’re not here to compete with each other. We are a human ladder to our dreams…sometimes we are the rungs for others, sometimes we are their wings, and other times they are those things for us. It’s truly a beautiful thing. Violet, this truly was a gift, asking me to ponder these questions. We don’t often have the motivation to sit down and think through our journey, much less share it with others. This was a wonderful opportunity! Thank you again! My name is Tina Carlborg. I am located in San Diego, I'm a photographer and I have recently done a few family portraits shoots and am getting ready to do a high school senior portrait shoot soon. Photography is my true passion and I want to pursue it. I also crochet and have been doing that since I was 10. A few years ago I opened up a shop on Etsy, however I closed it within a year, partly because I didn't have the support or confidence back then. I recently starting crocheted items again (animal hats as of right now), but I sell them on Facebook. I can crochet pretty much anything that is requested to me. I will be 44 on April 25th, I raise my two girls full time, as well as working as a bookkeeper full-time. Add that to my photography and crochet business endeavors, I am quite busy. Other than my two girls, it's photography and photoshop. I have recently been learning as much as I can with photoshop to be able to process my photos to the best of my ability. I have always loved photography. I remember getting my first polaroid camera at 10 years old. From then on, I was photographing anything I could. I took a photography glass in junior high and high school. Back then it was film photography and Iearned all about darkroom equipment and how to use it. I once wanted to have a darkroom of my own. But now, I get to have photoshop as my darkroom. A few years ago, I was taking pictures for a girls softball team and I was commenting to a friend how much I liked photography and he suggested I follow my dream. That was the first time anyone said that to me and I realized photography was a love that I wanted to pursue. I love being able to photograph what I see and to showcase that. My dream project would be to be that one female photographer down on a football field, or another sports field and have my photo published in magazines, newspapers, etc. It came from my friend who encouraged me with pursuing my dream of photography and another friend who received one of my crocheted baby blankets. They both said that I should follow my dream and that I should put myself out there. That I was good enough to do that. My inspiration comes from my friend, Stacy. I never thought I could do it all, and then she went and had a baby and started her own custom jewelry business on Etsy. I was like, wow, I have two girls who are older, but yet she has a newborn and she is following her dream? I can do that! What do you think is the biggest thing holding you back? Confidence or the lack thereof at times. There are times when I just say, "What are you doing? You can't do this!" But then I also realize that it's my inner demons trying to overcome my passion. That, and time. Working at a full-time paying job, raising two girls, volunteering, takes a lot of my time. I have to realize that I have to take baby steps and realize I'm okay with that. If I had more time to get it all done. More time to promote myself. But I know that in time that will happen too. I think the biggest thing I took with me from Flying Lessons was #1, figuring out what i wanted to pursue. I could't decide between photography, crocheting or sewing( yes I sew too). Oh, that and trying my hand at mixed media. I realized that while I know I'm a good seamstress and crocheter, photography was my passion. It was the one that I wanted to pursue the most. And learning that there are so many others out there like me. Ones that have that inner demon. Ones that are on this journey, just like me. I learned more about the business aspect of it too. I learned about branding, which is a big thing for me too. Thank you so much for wanting to interview me!!! Hi Violet! First of all, thank you so much for contacting me and giving me this opportunity. I really appreciate the chance to introduce myself to your readers. My name is Cindy Jones Lantier, of the Mixed Grill Favorites blog and podcast. I am mixed-media artist. I live in sunny Southern California with my amazing husband and three crazy kitties. I grew up in a small town in Arkansas; I still love that town, but I also love living half an hour from Los Angeles. Even though no one encouraged me artistically as a child (my brother was the one who got all that kind of attention), my mother did support my general creativity. In addition to teaching me to cook and sew, she encouraged me to try whatever activity the craft store was pushing that week-end. In addition to being an artist, I’ve also done several podcast interviews with other artists. I love talking to creative individuals about their processes and lifestyle. I put the podcast on (what seems like permanent) hiatus when my mother got sick and died, but I’m thinking it’s getting to be time to wipe the dust off and start again. With any luck, there will be new interviews this summer! I’m gonna be sappy here – I really love my husband! We’ve been together for about 16 years now, married for 13 years. He is my best friend and the person I most enjoy spending time with on a daily basis. He is wildly supportive and encouraging of everything that I decide to try. Some days, he is a bigger proponent of my art than I am! One of my dream projects would be to collaborate with some of my favorite artists on a book project. My heart is lifted by the written word as much as it is by expressing myself through paint and paper. But I don’t want to do another technique book for mixed-media artists. I’d rather do something directed at a larger audience, dealing with the theme of creative living or finding your artistic self. I believe that art has more to do with how a person does something, rather than what it is they are doing. I’d like to explore that idea more fully and with other people. My other dream project would be to own a studio/retail space/teaching venue and to connect with other creative people there. I’d love a place where people could come, make something special, and share tea and cookies with me. 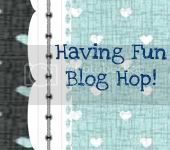 I like the idea of holding art nights or afternoons kind of like crops in the scrapbooking world! Bring something to work on, use some of my special supplies, and share fellowship with other creative people. I have received so much good advice that’s it’s difficult to narrow it down. The best advice given to me personally was probably to come to terms with the dichotomy of taking myself seriously as an artist – but not too seriously! It was important for me to accept that I am an artist, simply because I make art. It doesn’t matter that I don’t yet support myself financially with my art, that I haven’t been published in a national magazine, or taught at a major venue. I make art – that makes me an artist. On the other hand, it’s important that I don’t take myself so seriously as an artist that I don’t play with my medium by experimenting with new products and new techniques. It’s also important that I not take my work too seriously; if a piece isn’t going anywhere, I need to be able to gesso or paper over it and begin again. Another piece of excellent advice came to me from Elizabeth Gilbert, via a TED talk that she did: Show up and do the work. Strive to develop – and maintain – a creative practice. I admit that I don’t follow this advice well, but I think it would serve me if I would! Inspiration is a funny thing. Ideally, it comes from showing up in my studio and playing with my materials on a regular basis. I really believe that Inspiration happens best when I’m doing art on a regular basis; then my Muse knows where to find me when she wants to share something! My Muse uses colors and words to inspire me. I love to play with paper and paint and just see what happens. Often, it is Inspiration that whispers to me to try something I wouldn’t have otherwise thought of on my own. The biggest thing holding me back is … ME! I don’t think it’s so much a matter of fear of failure (or success! ), although I do think that fear is a factor. I think it’s more a matter of not holding my vision close enough to my heart. Jenny Doh recently wrote a blog post about discipline as a matter of remembering what we want. That really struck me because I’m a bit flighty. I have classic Shiny Object Syndrome. I think I need to remind myself more often of what it is I want, as a way of encouraging and nourshing discipline. I eluded to it in the previous question … Discipline. A conversation that I often have with a friend of mine revolves around this question: I enjoy doing something and it’s good for me. So why don’t I do it more often? We both agree that if we had the answer to that question, we’d be much more successful in our own lives – and could probably help countless people be more successful in their own lives, too! I have just started a mindfulness practice; I’m hoping that it will make a difference in my discipline, and therefore in my business. The biggest thing I took with me from Flying Lessons is the community. The course content was okay, but the support and encouragement from the community has been amazing. Most of the people in the group are genuinely concerned about each other. We openly share technical information, as well as our struggles and successes. Connecting with other artists who have similar goals and dreams has done a lot to give me more confidence in my own. Hi Violet! Thank you so much for having me! My name is Kathy May and I am an artist specializing in inspirational artwork for children. I really love animals and children. There is something so magical about the way young children think, as though anything is always possible, I really love that. I love animals because I think they bring so much beauty to our lives and so often we don't even realize it. Really anything that makes a child smile. I would be thrilled to be able to write and illustrate children's books or design paintings for pediatric units in hospitals. God gives us all gifts, in all forms and if you keep them hidden because you're too afraid or shy to share them, then you are not sharing your gifts that you were given. Teaching children that being kind, honest and doing your best every day feels really good and is important. The ups and downs of the art business. I am currently working full time in addition to my art work and I think if I had more time I would hope to be able to focus more on making that happen. What's the biggest thing that you took with you from Flying Lessons? All of the amazing friendships we have formed. My name is Jade Scarlett, I’m from Sao Paulo, Brazil but I have been living in New York City for the past 21 years. I’m newlywed and I have a 16y.o. son from a previous marriage. I was raised in an environment where art was not only discouraged but I was also told constantly that I had no talent and should therefore abandon any silly ideas about being an artist when I grew up, despite the fact that all I ever wanted was to be one. It took me many years to find the courage to start making art regardless of the fact that I didn’t believe I had the right to. Eight years ago I was very ill, suffering from a profound depression resulted from a deadly battle with an eating disorder that nearly killed me. It was through art therapy that I finally found the strength to overcome my demons and allow my childhood dreams of being an artist to surface. It wasn’t easy, the voices inside my head were very strong, telling me every second of every day how I didn’t have the right to do it, asking me constantly who did I think I was to have the nerve to walk into an art store and buy pencils and paints and dare to make art. I remember clearly the way I felt when I had my first painting lesson. My acrylic painting set was neatly arranged on my desk and for that one hour the teacher was there with me, I was nervous, frightened but ecstatic. After she left, I washed the brushes, emptied the water container and arranged everything neatly again. That entire week I had to wait until my next lesson, I didn’t dare to even touch anything, after all, who did I think I was to try and paint by myself? I simply gazed at it longingly, anxiously waiting for the next class and that magic moment I would have “permission” to experience the thrill of holding a brush and making marks on the canvas again. It was a long road to finally free myself from the fear that held me back, it took me a long time to find the confidence to draw and paint without the teacher. Art saved me, literally, from spiraling down into the never ending hell that living with an eating disorder is. Slowly but surely, the voices that were keeping me from living a happy and healthy life were being silenced by the other, much more important voice that helped me sort the mysteries of color theory, painting techniques, and the like. More and more I would just tell my demons to shut up already, I’m too busy figuring out the value range in this painting, or what colors to use or something like that. Two years ago, life decided to play a cruel joke on me and once again I was battling depression. For two years, I went to numerous doctors trying to find out what was happening to me. Without any changes in my diet, I started to gain a tremendous amount of weight, and for someone still recovering from an eating disorder, that was a major blow. I was finally diagnosed with Cushing’s Syndrome, caused by a tumor in my brain, which made my body produce excessive amounts of cortisol, thus the weight gain. Art once again played a major role in my road to recovery. After surgery to remove the tumor, many rounds of chemotherapy and radiation, the Cushing’s was somewhat under control but because the ordeal had a tremendous psychological impact on my still fragile psyche, my doctors decided I needed a different approach in therapy and knowing how important art was in my life, they sent me to a shrink who was also an artist. Blessed be that man, who understood from the very beginning that the way to approach me was not from a shrink/patient point of view, but to create an artist to artist relationship. Our sessions were more like a casual meeting between two artist buddies and by using unconventional methods, he was able to help me overcome the aftermath of the disease, dealing with the depression and bringing me back to life. Art had saved me again. It’s been two years now, I feel much better, still dealing with health issues, some days are better than others, but for the most part, art is what keeps me going, and gives me the strength to overcome anything. I wouldn’t know how to live a life without getting my hands all messy with paint and ink and glue and just having a great time creating art that speaks to me and heals my soul by silencing the voices that have hurt me for so long. Ultimately, through art I have learned to accept the simple truth that I *am* worthy, I do deserve to be happy and do the things I love most in life and most important of all, to accept myself for who I am, flaws and all. I love teaching; I really have a passion for it. I used to teach EFL years ago and more recently I started teaching decorative painting. Ultimately, it doesn’t matter what I’m teaching, I came to understand that my biggest satisfaction is to see that bright light in my student’s eyes when they have that wow moment where they realize they too can do it, whether is being able to speak and understand English or paint something they love. My dream is to have a large studio/gallery/art store/art school that would function as a meeting place for other artists to display and sell their art, work collaboratively, teach classes, sell art supplies and also have a partnership with an art therapist willing to offer their services for free to help young girls to overcome eating disorders through art and in the process, realize how worthy, deserving and unique they are. I know how important that is and how the term “Art Saves” is indeed very true. The best piece of advice I ever received was from my grandmother, who taught me that there’s much strength to find in community. Life’s hardships are better dealt with when we have a strong support system to help us overcome obstacles. It took me a long time to learn how to trust that I didn’t have to be alone, that I was worthy of receiving help. I find inspiration in everything around me. The beauty of nature, an exceptionally gorgeous sunset, the feeling of the wind brushing against my face, the music of my favorite musicians, the changing of the seasons, gazing into the eyes of my love, paintings of my favorite artists, a smile on my son's face, and even in the most mundane of activities such as watching suds forming on the surface of a dish I'm washing. Inspiration is everywhere, in everything, all the time if only we allow ourselves to be open to the beauty and poetry of everything around us. Fear, I guess. Even though I have learned to trust myself and just do what I love, there are still moments where I catch myself asking who do you think you are. I want my art to make a difference, to speak the truth that is hidden deep within my soul and there are times I feel I hold back and I don’t necessarily translate those feelings into my paintings. That’s when I usually experience a creative block, when I look at my pieces and think that everything is very “vanilla” and I’m not allowing my true self to speak. I want to paint with abandonment and I feel that fear is the primary thing holding me back from doing so. Fear that I’m not going to be able to make that kind of art, fear that no one will understand or even like what I’m trying to say, fear that I’m being overly influenced by the artists I admire and thus not allowing my own style to shine through, and I guess most of all, just plain fear that I’m not good enough, that I’m a fraud, not a real artist. Definitely, better time management. I work full time, I have a family to take care of and therefore I only have a small amount of time left to dedicate to making art “and” tending to my business. I get overwhelmed often because I don’t know what to do first. I’m trying to create a schedule and follow it strictly to hopefully improve my time management skills. The community, without a question. Even though I don’t spend as much time as I wish I could in the FB group, just knowing that all those amazing artists are there to support each other in a loving, caring and non-judgemental way gives me such a joy. That’s very precious to me; I really love being a part of such an incredible group! Thank you so much for the honor of giving you this interview, Violet. I know how much I enjoy reading your blog and I hope I others will enjoy reading my interview as well. This has been at the same time difficult but freeing, I still find it very hard to be open about myself, but I’m glad I didn’t hold back and just said it how it is. Shine Brightly! Earlier this year I had the opportunity to take a course called "Flying Lessons" given by a very talented artist - Kelly Rae Roberts. It was an excellent course that covered such topics as letting go of yours fears, going after your true passion, and many other things. One of the best things about the course was, I got meet and learn about a lot of talented artists, all in on different paths, but all working towards making their dreams come true and learning to take flight. Flygirl Fridays is all about these wonderfully talented people and a little bit about them, so you can get to know them as well! I love my daughter, it's obvious why, she is the best thing that ever happened to me & I feel very blessed to have her. She will be two in April, life is a bit of a rollercoaster being a new mum, trying to raise a toddler & trying to live a creative life but it is the most rewarding life there is & it’s mine!! I love it! I didn't always love my life but I can definitely say now...I love life! It makes sense that it is what I love to explore with my camera..
My dream project would be combining all the things I love into a little business & doing it for a living...I have some ideas that I am working through & hope by next year that I may actually have something up & running. In the meantime I am working through the little dreams to get there & having the best time along the way. My inspiration comes from emotion & nature...I find them both beautiful in so many ways. Most of my photographs are of these two things. When I photograph them I find I am inspired by tone, line, space, texture & the feeling of the moment. The biggest thing holding me back would be myself & time...I still find that I lack the confidence to just go out & do what I dream about, NOW! it takes time to get there but going back to question 4..i must remember...baby steps...when I look back on my confidence five years ago...I have come a long way...I will get there...& when I do...it will be the right time...I am a big believer in that! Our lives unfold the way they are meant to. Good & bad. All makes the journey more interesting & us stronger in the end. Awareness & word of mouth....that comes down to marketing.....in the online marketplace I must ask for help from my online community....please will you share?... 'like' my FB page, share it with your friends...follow my journey...tweet about me...share my photos, my inspirations & the things I love... share my blog posts, comment on them...like my Etsy store, share it...buy my stuff...lol! That would all help my business grow & so will the growth of me...you all help me to do that too! Thanks for reading this & being a part of my journey! I took so many things from flying lessons. Listen to the whispers, BELIEVE in yourself, your DREAMs, your goals, we are worthy of doing the things we LOVE, find the COURAGE to do them, they are IMPORTANT. I also learnt a lot about the online community & found a wonderful supportive, encouraging group of ladies on their own creative journeys to share the ups & downs with along the way. I have been very fortunate to be able to meet some of them in person. I hope over the years to meet many more! Thank you so much Violet, for the interview, you asked some great questions! It was a pleasure to be featured on your blog. Please introduce yourself, who are you and what do you do? Hello everyone!!! I’m Stacey Curry from Star Hitched Wagon. A huge thank you to Violet for allowing me to jabber a bit as this week’s Flygirl! What a huge honor! So a little about me…I am what I consider the Master of Chaos here at Star Hitched Wagon, I am a jewelry designer, potion maker, sales and marketing girl, book-keeper, photographer…you get the picture. I am living the life I have always dreamed about…I am a creative business owner working from my home studio. I am married to my high school sweetheart Steve, we have 3 beautiful children and a chocolate lab. We live in Wyoming about an hour away from the beautiful Big Horn Mountains, where inspiration is abundant!! I also enjoy running and am training for my first full marathon as we speak!! This is my stress reliever, when I’ve hit a wall, or the fear of rejection gets to heavy, or I just have way to many ideas bouncing around in my head I run! I run to get clear, to find my lost focus, to pray, to meditate, to build myself back up! What is something that you really love, and why? Family!! I’m a family girl!! I am blessed with such an awesome family…my husband who is my high school sweetheart, my three beautiful children, my parents, two sisters, nieces and nephews, my Grandma, lots of aunts and uncles and cousins…AND I married into an awesome family as well. I LOVE our family. They are so much fun, full of so much love and so much support!! They make the world go round!! What would your dream project be? Right now I would have to say an inspiration collaboration with other artists of many mediums. This is not an original idea of mine, I was totally inspired by a fellow jewelry designer by the name of Erin Prais Hintz. She did a collaboration at her local art gallery, creating multiple pieces of jewelry inspired by many different pieces of art. Ever since she shared this concept with the world I have been dreaming about doing something similar. With all the extremely talented artisans out there it is impossible to not be inspired. The colors, the textures, the themes…I could create an entire line inspired by other artisans. One day I will and I will share it with the world in a beautiful gallery! Hmmmm…now I just need to find a gallery and a few artists to go along with me! What’s the best piece of advice that you’ve ever received? This is not business related but it is such terrific advice!! My grandparents told me in the early days of marriage to never good to bed mad. It took me a long time to get there and trust me I still go to bed mad, but let’s face it…everyone feels much better when issues are resolved before we go to bed. We all need a good night rest so we can start the day out on the right foot! Where does your inspiration come from? I will say nature is an unending source of inspiration for me. I love being outdoors, walking, looking, taking it all in. I am amazed at the huge bare tree or one full of big beautiful green leaves. I am equally amazed at the itty bitty snail hiding under a fallen branch. When in this environment my mind is clear. I love running and walking at the local "lake" or "woods", there I am truly at peace, fully aware of my abundant blessings. I can clear out and then let the inspiration come in. I can see a new color combination in the bare brown trees covered with bits of snow, maybe white agate with picture jasper. Or the lake covered with snow, this could mean amazonite and white freshwater pearls. It could be a name - I see a wide open space, it is beautiful and quiet and I feel so calm, this could lead to me adding a "Clearing" or "Reset" or "Anew" to my collection. A beautiful painting with certain colors inspires yet another new color combination. A quote brings press about a feeling which translates into a new named set. A random stranger's outfit inspires a design. Truly with this art, the sky is the limit. What do you think is the biggest thing holding you back? If I am 100% honest and REAL here I would have to say ME!!! I stand in my own way too often, I have moments of great momentum and then I hit a wall and fall back. I am really working on working through those moments of fear of rejection and of failure. If I don’t try I can never succeed!! What change do you think would most help your business grow? It is time for me to get organized and committed to taking my business to the next level. This is going to take a lot of hard work, a thick skin so I can present my line to boutiques and galleries, and time and effort connecting with people who value lovingly created goods from a passionate artisan! What’s the biggest thing that you took with you from Flying Lessons? Flying Lessons was so inspiring, truly made me feel like, “why not?” I really felt like I could do it and that I was worth it. Flying Lessons also brought together an amazing group of cheerleaders, advice givers and friends!! This group of Fly Girls continues to inspires, encourage and move me in the right direction, which is 100% needed and fully appreciated! Hi. Thank you so much for asking me to be your guest. I’m so thrilled. My name is Melanie Douthit and I live in West Monroe, Louisiana. I operate a creative business from my home-studio. I’ve been an artist as far back as I can remember. My earliest artwork my mother saved goes back to age five. I started painting in my late teens and started selling my art soon after. Around 2000, eBay was a great place to sell art, and I quickly had collectors in all fifty states and also abroad. Being from Louisiana, I love New Orleans, so many of my creations have a New Orleans flair. My Mardi Gras Dachshund paintings were commissioned by a national chain restaurant - Mimi’s Café - and there are over 30 paintings in various locations across the US. Around 2003 I got involved in the paper craft industry designing cards and scrapbook pages for magazines and manufacturers. It didn’t take long for me to merge my two loves together. It’s not uncommon for me to use “paper craft” products in my paintings now. I’m a member of the oldest and largest co-op artist run gallery in Louisiana, the Ouachita River Art Gallery, and I also have work in The Great Artists Collective gallery on Royal Street in New Orleans. Gosh, I can think of so many things that I love, but I’ll just go with cooking. I love trying new recipes and experimenting with ingredients. Not that I’m a chef or anything, but I think it’s just another creative outlet for me. I love cooking for dinner parties or gatherings. I like decorating the table with pretty dinnerware and serving pieces. The highlight is seeing it all come together when family and friends enjoy the food and fellowship. It really makes me happy. I recently hosted a murder mystery dinner with a Mardi Gras theme and am already mentally planning the food for the next themed dinner. Since my late 20’s, I’ve had the “dream” of illustrating a children’s book. That dream isn’t too far off. I have a story that I’ve written and it’s on my “to do” list to bring it to life this year! Wow - there’s so many things going through my head for this question, but here’s one I’d like to share with other artists: Never put all your eggs in one basket. How I apply that to my creative business is to not limit your art exposure to just “one” place. Put your creations on etsy, your blog, and your website. Explore new ways for internet exposure. And for the local scene, try galleries, gift shops and local art shows or gallery crawls. You never know where your next collector will come from. Your art is as unique as you are, so what works for one person, may not work for the next. I love visual inspiration. Color combinations and current trends trigger my creativity. I usually jot down ideas or drawings in a notebook so I don’t forget them. Lately, I’ve been inspired by music. Sometimes a phrase or a lyric will stick in my head and I will transform that into something fun and funky. I most always have music going when I’m creating. The biggest thing holding me back? Myself! I can go as far as I dare myself to go. Overcoming fears and doubts is a big hurdle that some days is easier to jump over than other days. When you run a creative business, you have to motivate yourself, even when you “don’t feel creative”. People with non-creative jobs go to work when they “don’t really feel like it”, but sometimes it’s harder for creative people to “work” when there seems to be no inspiration. The trick is to do it anyway. My motto is to dream big and shoot high. If you shoot high, you won’t be disappointed if you miss the mark. I’ve actually been growing at a manageable rate for the past year, so at this moment, I’m happy to comfortably be able to keep up with things. I have a few ideas for the future, but I don’t want to get overwhelmed. I’ve been told that when the demand for your art goes up, it’s time to increase prices. I’ve been trying to hold off doing that, but it might be the next change in upcoming months. Aside from the new friendships, which are priceless, the biggest impact Flying Lessons had on me was to be fearless! I was recently approached to participate in a rather large event (more on that on my blog later) and in the past I would have shied away from it, mainly from fear. But thanks to my new found “bravery”, my response to the request was “absolutely”. We are still working on the details, but I’m so excited and, of course, will be extremely busy. I hope I’ve inspired some of you out there reading this. Go for your dreams and enjoy the journey! In "Artist Series; Flygirl Fridays", "Melanie Douthit", "flying lessons"
Hello I am Helen A. Naylor. I am British and very proud of that. We moved to Australia in 1982 where I now live. I am an Artist. An artist of many mixtures. moved, my old uni is now over an hour’s drive and 100kph away this uni is 4km away. Another hat is my Pottery Hat. I have been playing with clay since about 1996. I started this to have a balance from the very controlled art form of my Animation. I am still controlling the clay! Raku is my fav. It is really a three person job to fire a Raku. I have trouble getting friends to help me due to they see their life is at risk. So I don't get to fire very often. I do have quite a back-log of my idea of, totem poles awaiting for brave friends and the right weather to come along. Soon I hope. I make alsorts of things in clay. From necklaces to plates. I found my strength to stop at a lovely shop St Barts ( http://www.st-barts.com.au/ ), which I shop at far too much myself and show them my plates which resulted in an order for 61. Be careful what you wish for ladies ! I now have my necklaces up on my new Etsy shop (http://www.etsy.com/shop/ArtConglomeration ). Up until now I had been selling my pottery through word of mouth and art shows. My other Hat is Glass Bead Making. I would love to do glass blowing. This is the closest I could come to it. Yes you guessed it I like to play with fire. Controlled fire that is ! 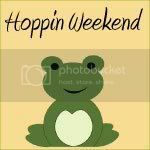 I had been watching a great American show called Crafters Coast To Coast. They kept showing bead making. I thought one day when the laptop was on, "I am going to do this, I don't care how much it will cost to get the equipment from the USA" Well that was a Tuesday. I discovered an underground sociality of Aussie bead makers. On Saturday morning the boys were sent off to the "out back". By lunch time we were on the patio making beads. Hence the name Patio Beads. I sell them in a shop from time to time, thanks to a visit from my cousin Gillian and her strength. Mainly it is word of mouth and art shows. They are heading to a gallery shop real soon. I recycle parts out of aircraft. Usually their navigation systems and radios. I do this with a soldering iron and grinder. I then arrange them in a shadow box. The whole idea of these pieces not going into land fill excites me. Yes I am a greenie ! But the fact that some of them have flown all over this planet of ours and talked to so many people in so many far off lands that most of us will never go. And here they are on your wall. The surprise I get when I open up the really old radios ! They are art in themselves. I am sure I can feel the conversations they have holding secret in their components. There are more Hats but I am worried you will get bored and leave lovely Violet’s blog so I shall stop there. Oooooo I love so much. I love the internet. I got my first email address back in the early 90's. It was all numbers 100035.3442 yes that was it. I love my chickens they calm me. I love recycling. I love that the world has finely got on board. I love Louie and Simon. They love me back. Gosh I have a few. The main one is happening right now. My studio, at the bottom of my garden, where else, was flooded 2 years ago. I lost so much in the way of supplies and art work. You know how you collect things for a rainy day! Sad but maybe i should have cashed in a few rainy day cheques. There is a lesson to be learnt there I am sure. I have been living out of containers ever since. My farther in-law has flown 1000 kilometres to come and level the floor and lay down reclaimed wide, hardwood, floor boards. A new door way and door too. So that is a major project. When it is done I plan to move back into it and start turning my skills as a Traditional Animator with my limited skill of computer animation into one that will be my own. A combination of old, new and me. To be animating again is my real number one project. I have been working artistically to for the last year with e-courses and books to ready myself and fill my artistic well. My dream, dream project would be to have a modern warehouse set up for iron works sculpturing, glass blowing and glass bead making. It would have resident artists in their fields from around this lovely planet of ours working on their own projects and giving lessons. "Simple, just "BE" an artist. No more discussion. This is what you do and it makes your heart sing. The rest of the worlds inhabitants can either agree with you or get on with their lives. You make art in all shapes and thats it." It had been bubbling in me for a few weeks since I had made the big step to buy myself a kiln. (http://findingmycreativewings.blogspot.com.au/2012/02/i-have-been-making-plates-for-long-time.html) There has been a sense of freedom in me which has had such an effect on my life. It was talking to Yvonne (http://muddleonthrough.blogspot.com/ ) that brought it out into words. So I think that is my best piece of advice to date. It was my own. Usually from my collection of supplies. Had you asked me a year ago I would have said a community to belong to of like-minded arty people for inspiration, encouragement and support. Today the answer is to "Trust" myself and to follow the "Flow". Get my work out there. If you had asked me a few weeks ago, the answer would have been some-thing on the lines of, for me to get out of my own way. That would have to be the reasons to have a blog, twitter, etc. I opened a Twitter a long time ago. https://twitter.com/#!/HelenANaylor I really didn't see the point of it. To tell you the truth and to have you see me as a sheep, it was Martha Stewart who encouraged me to get one. https://twitter.com/#!/MarthaStewart I too started a blog in 2000 at Uni while doing a degree in Multi Media. Again, I didn't see the point. Yes, I like to keep a diary, Whoops haven't for a while, hmm, actually I do a visual diary of my day. No words or symbols. Try it, it is hard work. Just do very easy scribble type line drawing to show your day or it will become some-thing else. Oh yes, date it too. But I didn't see the sense in writing it online. It is out there some-where, waiting for me to return! But after reading how KRR's was found due to her blogging the birth of her creative life, I totally got it. I saw the importance of being seen to have a presence in the world. So I opened one. The importance of it hit home when I picked up the courage to go into a shop to show them my plates. I had to run home and ask you all to follow my blog and like my FB Biz page real fast to make it look like I did have a presence. It all worked. You were all brilliant, thank-you again. There is another thing that I took with me but having said that I don't know if it is the right way to put it. This community we have, all of us, this immense friendship we now have through our Fly Girls FB page, this is what I what I loved most about the course. But we built this. It is all of us that created it. Without the personalities, the love, the joy, the caring, the knowledge and willing to share all of them with each other without all of that it would just be some people who took a course. This is what I love most. I love all of you. You are the gift I received from the Flying Lessons. Thank-you Violet for having me as your guest on your fabulous blog. It has been an honor to chat with you. Keep up all the great work you are doing here and in your life. If any of your readers would like more information on me I would love to hear from them. Please like me and follow me. I am spasmodic in my posts but I am told they are always interesting. Here is the never ending list of places you can find me at any given time. In "Artist Series; Flygirl Fridays", "Flygirl Fridays", "Helen A. Naylor", "flying lessons"
Hi, my name is Kelley Miller. Although I am a Southern California girl born and raised, I currently live in Kentucky, just south Louisville. I am an RN by profession, but after an accident at work 5-1/2 years ago left me with an injured left arm and hand, and after the subsequent surgeries....I turned to Art to heal both physically and emotionally. I currently am a Mixed Media Artist. I sell originals and prints of my work. It’s not something, but someone, I LOVE my 21 year old Daughter Courtney. She is the best thing I will have ever done. She is kind, talented, and smart. She has the best inherent people skills I have ever seen. And to top it all off, she's beautiful on the inside and out. Well even though I'm a Visual Artist. It has always been my dream to be a recording Artist. I have been a singer since before I could talk, and have performed since I was in middle school. So I would love to Record an Album. Unfortunately, I'm just an adequate singer, and not recording material. So maybe the next best thing would be to design an album cover...that would be cool. My Grandmother, whom I lived with for a short time during high school, helped me address the uncertainties that a high-schooler deals with.....and the best thing she ever said to me was, "Kel, if you can’t change it or do anything about it...you just have to move on." Although I try, I don’t always take her advice, but her voice is always there in the back of my head. I miss her. All those feelings that rise up that tell us we aren't good enough, like Fear, Inadequacy, and Shame and then the actions and attitudes we as humans can do to combat those feelings.....such as Kindness, Humility, Purpose, Generosity, Mercy, and Grace. I guess just the Human Condition, and how we can rise above it and facilitate others to rise above it as well. That inspires me! Definitely the fear of Success. I’m not sure what that is about. I ponder and tackle that one every day...and I hope that I am making progress figuring that one out. I think I am. Its slow progress, but I know I'm leaps and bounds from where I was a few months ago. So that's somewhat reassuring to me. Having belief in myself and what I create. I quite like what I create for the most part and others seem to like it as well, but for some reason I can’t quite wrap my head around the fact that others would purchase it. While I have had a few sales, it just seems so odd to me that this could actually be my job. So clearly, my frame of mind is all that is holding me back. The biggest thing is the support of the great Tribe of Ladies that emerged from our Facebook group our "Fly Tribe". This group is one of the most generous, encouraging, smart, talented, non-judgmental groups that I have had the pleasure to be in contact with. It's a safe harbor for me, and even when I’m not too active with posts myself...just reading them calms me down. There is just a bond there that goes way beyond the Art and the business of Art. I am so thankful they are in my life. I am so thrilled to be featured here today! Thanks Violet!! In "Fly Tribe; WordHop 2012; Believe; Artist", "Kelley Miller"
My name is Lynda Metcalf. I'm a wife, a mom of two wonderful children and an artist. Before getting married and having kids a few years ago I tried my hand at a mural/faux finish painting business. It never really took off. Now I'm immersing myself in art again and exploring mixed media. I love painting. I find it to be very forgiving as you can always paint over something you don't like. I also like the versatility of it. There is so much you can do with paint. I learned some very fun effects back in my faux finish days. And I love all the exciting products that are out there now that create paint effects like the Caran D'ache water soluble crayons and Inktense Pencils. I also love photography. My iPhone gets used a lot. I want to find my style. I have been taking a lot of e-courses and learning various techniques but, my projects look like the instructing artist's work. I want to adapt what I learn and make it my own. I also would like to somehow tie my photography into my art. I'm still experimenting with that. Eventually (sometime this summer I hope) I want to open an Etsy shop. I think it may be the saying "Leap and the net will appear". Sometimes you have to just go for it. Trust your gut and take a chance. Maybe that's why I like painting and creating so much. On some level you are always taking a chance that this project is going to be an epic failure. I'm not afraid of that. Sure, I may get frustrated and I have been known to toss something I really don't like, but I don't give up. I get out my frustration, then I get out the white paint. Almost any failure can be turned into a success. I also try to be aware of what "excites" me. What artist or technique makes my heart skip a beat? If I get that kind of feeling from someone or something I know I have to research it some more. I think illustration has always inspired me. I love the Disney animated films. I collect children's books. I'm almost always drawn to whimsy. Nature is also a big inspiration for me. Walks in the woods. I have bird feeders. Eventually I want a nice butterfly garden. Nature often inspires my photography. I try and capture the light, color or texture you find in nature. Right now, it's lack of time. Being a stay-at-home mom of two kids (ages 4 and almost 3) is a huge job. I have a difficult time getting into the studio to paint uninterrupted so I have to limit my projects to short ones. I'm teaching myself to draw and that is easy to squeeze in. I'm also giving working on multiple projects a go to see how that works out. I just can't seem to create product for a store at this time so I'm choosing to educate myself. Choosing to learn takes the pressure off and I can enjoy the process. When I get my kids in pre-school in the fall. I'm looking into the options now. There are lots of summer camps for the pre-school age too. If I can manage a regular schedule I can hopefully get a steady groove going. I'm also trying to figure out a way to paint with my kids. It has yet to be successful. They need my help a lot so, I'm not getting a turn to paint. I keep trying to teach them about taking turns! Maybe I just need a big lazy susan for us to put a canvas on and we just spin it around taking a turn painting. That actually might be fun! The biggest thing and probably the most valuable is all my new friends. It is so wonderful to be in this community of creative women. Everyone is at different stages in their business. Some are published or have licensed their work. Some have Etsy shops and have been blogging for years. And some of us are still learning or just dipping our toes in the water. We all support each other no matter what stage we are in. I also think we are all open to learning from each other. The support and the openness of this group really squashes any fears that may come up. Fears and doubt get smothered by our positive voices. Our Facebook group is the best place to go when your day is wonderful or when your day is rotten. 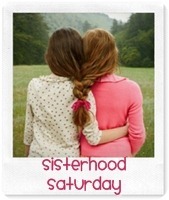 I have yet to meet any of these women face to face but I know I can call them friends. In "Artist Series; Flygirl Fridays", "Lynda Metcalf", "flying lessons"
I am part of a wonderful Fly Tribe filled with Artists from all walks of life and all over the world. 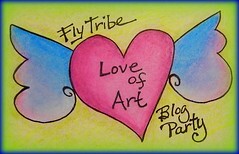 In honor of Valentine's Day, the Fly Tribe is hosting a blog party, Love of Art. My love of art began began when I was a little girl. I have always loved creating, and it comes from way deep down, I can't really explain it, but when I am creating something, anything, my heart sings. I enjoy all kinds of arts, crafts, and creations. To be able to combine colors and textures and actually produce something with your hands. There is no describing the joy you feel from that. 1. I get to make things with my hands. 2. It makes my heart sing "to create"
3. I love the concept of design. 4. Combining colors and textures are so much fun! 5. There are endless possibilities. 6. Imagination is the only thing holding you back. 7. Rules can and SHOULD be broken! 8. It is the BEST stress reliever! No kidding!! 9. I get to enjoy and admire other people's creations. 10. Art creates beauty in world for ALL of us to enjoy! Visit our Blog Party and immerse yourself in the "Love of Art"
In "Artist Collective", "Creativity", "Fly Tribe; WordHop 2012; Believe; Artist", "Hello Soul Hello Business", "Inspiration", "Love of Art Blog Party", "Valentine's Day"
My name is Clare Docherty from Glasgow in the West of Scotland and I am trying to find my way in the world of art. I have always loved sewing and creating “stuff” but have wanted to paint for years, so recently I have been taking some classes and exploring my creativity in new ways. I work as an environmental consultant but find the corporate world very stressful and would love to find a more soulful way of making a living. I am also mum to my amazing little 7 year old daughter, so life is pretty busy! Travel – there is something about going to another place and soaking up the atmosphere and culture. Some of my most loved places outside Scotland are Paris and Barcelona, as well as California (Love!!!). I love to feel the “buzz” of a place and appreciate its design, art and beauty. I haven’t been able to travel as much as I’d like in recent years, but there is plenty of “wander lust” in me! Design– I love design – I mean the broad range of design from the thought process of developing a simple every day item to the patterns on a furnishing fabric to the form of an iconic building. I love design that is clever and multifunctional but is also a piece of art in itself. I am a huge fan of the Art Nouveau period, where design encompassed everything from the form of the building, the interior decoration, the furniture and right down to an individual piece of cutlery. At the moment I am really enjoying the return of “mid century” design, which fits in with my current home – a 1950’s terraced house! Architecture – I am fascinated by beautiful structures and in Glasgow we are very lucky to have wonderful buildings by the master of Art Nouveau, Charles Rennie MacIntosh. I also adore the works of Antonio Gaudi and have spent many hours wandering through his amazing structures in Barcelona. And who couldn’t love the Eiffel Tower? I adore this structure and love that this and many other amazing buildings in Europe were built for one of the large exhibitions around the turn of last century and were meant to be temporary (imagine the cost of this today?)! I love the ocean – I find it calming and healing, whether I am on the west coast of Scotland or the Mediterranean, the sea has a real draw to me. I also love to listen to music and love the way it can be uplifting and inspiring. I have a broad music taste but especially love Latin American music, a lot of 60s sounds, current hip hop and R&B and the master himself, Stevie Wonder. I also love the internet! An endless source of information and opportunities – what did we ever do without it? I find this really hard to answer as I have had a lot of guidance and reassurance over the years for which I have been very grateful and to pick something in particular is very difficult. A very important lesson I learned (especially while training in Shiatsu massage) was to protect myself, energetically, not take on other people's s**t and likewise, not to project my own issues onto other people. We are only responsible for our own feelings, emotions and actions and it can only be a healthy thing to stop taking on responsibility for others’ issues. It's hard, but I have found it helpful to keep stress levels down! Where do I start? Nature is always inspiring to me. There is so much beauty surrounding us in the shapes, textures and colours of every day things. I was really inspired by the amazing colours in the autumn leaves last year and the shapes made by tree branches in my garden. My daughter, Roisin, is a constant source of inspiration! Children are so open to exploring their creativity and my little one has a definite flair (I actually “borrowed” an idea from her for the Fly Tribe’s ATC swap with “Love” as the theme – she pointed out that strawberries were shaped like hearts – hmmm, love that idea………..she did nab the best strawberry picture, though). Of course, other artists and designers inspire me (as you can see in my answers to what I love!) and more recently I have been totally inspired by Kelly Rae Roberts and of course the women in our Fly Tribe. I love seeing their work and hearing of their successes and to be part of such a positive, supportive community is constantly inspiring. Unfortunately there are several things!! Fear – of not knowing what I am doing, of lack of any formal art training, of not being good enough, fear of not making enough money to support my family, etc, etc. Also, I have a complete lack of discipline! I am not so good at starting things (procrastination is my middle name) and I am not so good at finishing things (I’m great in the middle!!) and I tend to jump around from one thing to another and never finish projects. If I could just make myself get all these ideas in my head out into the real world, it would be a great start! Focus is what I need and lots of it!! Also, belief - that I can achieve the things that are floating around inside my head. I feel I am at the start of my creative journey and I am in a learning phase at the moment. I have set myself the challenge to start a blog this year and develop my skills in painting and mixed media. I am taking a number of classes (Hello Soul, Hello Business, Amelia Critchlow's Experimental Art Course, Tamara Laporte's Life Book and a few more!) - who knows where it will take me? It has to be my Fly Tribe – I had no idea that an online community was possible! I was slow to get into the world of social media so it has really opened my eyes to a world of opportunity and friendship that I couldn’t even have imagined! The only downside is that there are just not enough hours in the day to connect with the Tribe as much as I’d like – there is always so much going on and such great advice and camaraderie that it’s easy to just stay in that bubble, but you have to go and get on with the “real” world! At least I know that it will always be there when I return. In "Artist Series; Flygirl Fridays", "Clare Docherty", "Sally Rose; Mixed Media; Artist Series; Flygirl Fridays", "flying lessons"
Michelle Reynolds from Shells in the Bush! G'day, I'm Michelle Reynolds from Shells in the Bush, I live in the Perth hills in Western Australia and I'm an artist, wife and mother of 2 young men. My paintings are abstract, bright, colourful with lots of layers. I also like to make jewelry with my paintings as a part of the jewelry. I really love to paint with acrylics because it's challenging and rewarding and when I paint it's all I can think about at that time so I put everything else, such as my problems, kids, husband out of mind and concentrate on the painting. I began painting three years ago and have explored drawing, pastels, watercolours, collage, mixed-media but really fell in love with acrylic paints. It's now a large part of who I am and feeds something inside of me, it's something I have to do and if I haven't created in a few days I get a bit antsy and know that I just have to create something to be happy. A commission for a large building such as an office or hotel - something where I can paint large paintings. Designing and seeing my art on luggage, wine bottles, CD's, stationery and fabric. Paint for yourself and not for anybody else. Life experiences, nature, other artists and their artwork. Fear - as an introvert I find it difficult to go to galleries and say please hang my paintings. Getting over the above fear, have an exhibition and working out how to turn my large paintings into prints so I can set up an etsy store. How important your art community is to your art - the support, encouragement, inspiration you receive from other creative souls is invaluable. In "Artist Series; Flygirl Fridays", "Michelle Reynolds", "Shells in the Bush", "flying lessons"